Growing Green: DO TRAVEL BANS ACTUALLY MAKE THE COUNTRY SAFER AND GREATER? DO TRAVEL BANS ACTUALLY MAKE THE COUNTRY SAFER AND GREATER? The President is finding all kinds of ways to mix up immigration and terrorism—and his goal seems to be to scare us into keeping immigrants out. History teaches us that fear of immigrants is a regular and regrettable occurrence. A few weeks ago our President banned travel from seven Muslim-majority nations to """[PROTECT] THE NATION FROM FOREIGN TERRORISTS". The intent is certainly noble, but the idea is full of problems. After hearing over and over about the dangers of Islamic jihadists coming to the U.S. from overseas, I took a look at the data myself. Here for an interactive version of the data, including details on the incidents. As you can see, in the ten years between 2005 and 2015 there were 112 deaths from terrorism. Only 21 were caused by foreign jihadis. Those deaths are absolutely tragic, and it’s enticing to think we could magically make foreign terrorism go away. But no system is perfect, and the proposed travel ban would not have protected us from the terrorists who did kill in the U.S. in the last decade--none of those foreign terrorists were from countries that were banned. Those tragic deaths pale in comparison to the ways we are literally killing ourselves. Foreign terrorism was one hundredth of one percent (0.01%) of the homicide deaths between 2005 and 2015. The money we spend (and the income we lose) in an attempt to control foreign terrorism would keep more Americans safe if it were applied to problem at home. 3) The immigrants we fear today will become our peaceful, productive neighbors tomorrow. The U.S. has a long and sordid history of intolerance towards immigrants, probably people who are now your neighbors. In the 1840s and 1850s, fear of Catholic, Irish and German immigration was so strong a political party called the Know Nothings came into existence on the platform of keeping them out. Churches were destroyed in riots. Priests were tarred and feathered. Even in certain cases where the immigrants were demonstrably terrorists, we took them in and assimilated them into peaceful, productive citizens. For example, the U.S. allowed in thousands of Irish terrorists in the late 1800s. In 1881, U.S. based Irish terrorists built a submarine to sink British ships coming to U.S. ports. The Fenians were caught before the Fenian Ram could be put to use). We also accepted 10's of thousands from countries suffering international terrorism on a huge scale in the 1980s and 1990s: Nicaraguans and el Salvadorians. The difference seems to be in those cases that the U.S. government was actually complicit in the terrorism. Immigration bans have their role in managing our workforce, but as a safety measure they make our country weaker, not greater. They make us poorer as a nation, both economically and culturally. [T2] And they do not contribute to the safety of the country. The Immigration bans will end up on the wrong side of history. The big question now is how wrong, and how long? We are about to find out. Ed. note: You may share this piece on social media by clicking one or more buttons below. Thanks for reading! and for sharing! Proud to announce this first use on the Growing Green blog of a Tableau data presentation. Labels: Do travel bans work? 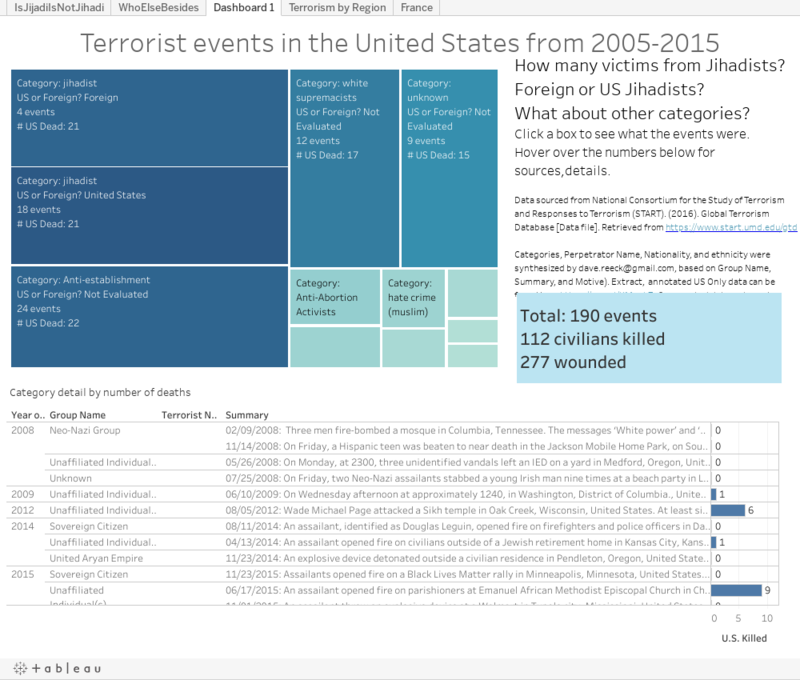 Data on foreign born terrorism in U.S.